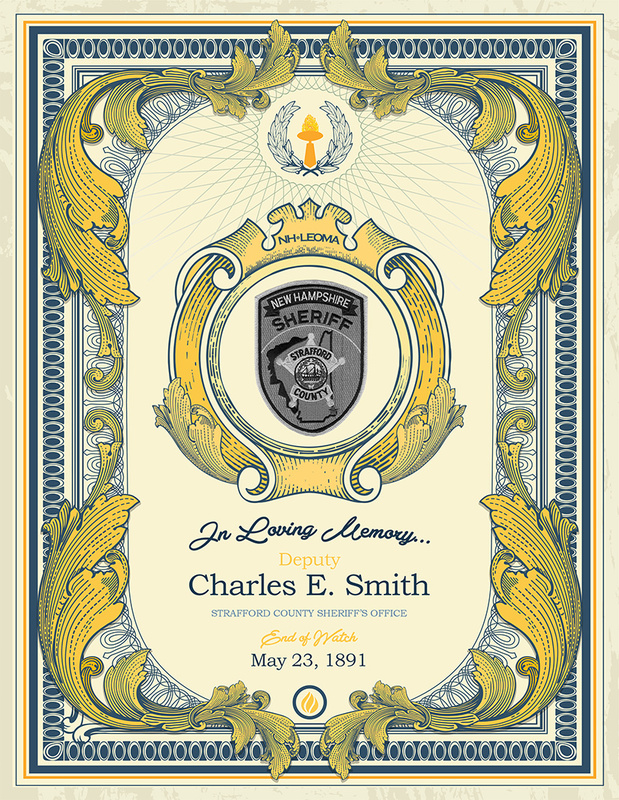 (Hall) Smith, Deputy Smith was a farmer, a merchant, and a town selectman as well as a six year member of the Strafford County Sheriff ’s Office. named McArthur, from the stable at Calef ’s Country Store/Inn in Barrington. Shortly thereafter, a posse of a dozen men, led by Deputy Smith encountered McArthur in his hiding place. Deputy Smith attempted to arrest him but McArthur ran off, shooting behind him as he went. McArthur was shot in the back by a civilian member of the posse and as Deputy Smith made a second attempt to arrest him, McArthur shot him in the hip at close range. Newspaper reports state that an injured Deputy Smith still managed to bore the thief to the ground. and the posse decided not to hang McArthur at Deputy Smith’s request. died as a result of the infection on May 23, 1891.